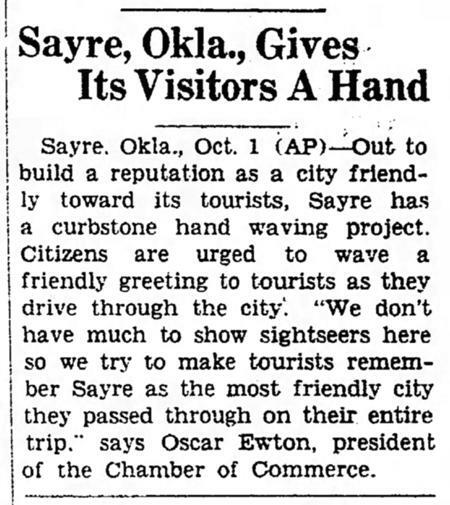 1941: Reasoning that "we don't have much to show sightseers here," the residents of Sayre, Oklahoma found a different way to attract visitors. They all waved at tourists. Back when travel was on a 2 lane strip of (if you were lucky) asphalt and one @#$@#$ driver doing 30MpH could pull a convoy of 50 cars & trucks. 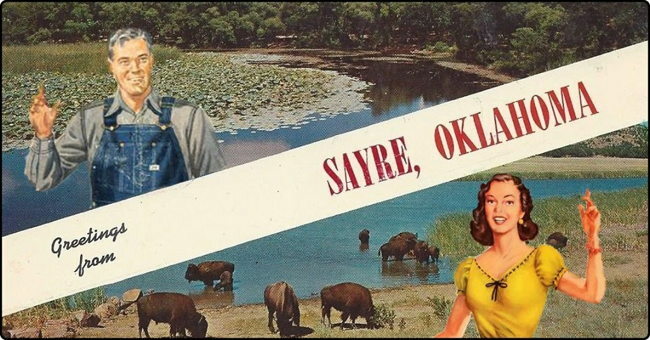 My first thought is, why would anyone drive through Sayre in the first place, and without looking it up on a map, I would guess because it's probably on Route 66. Fritz: Back then you drove THROUGH towns on your way to where ever you were going. There was no 'interstate" and "bypass" hadn't been thought of yet. The Interstate Highway Act wasn't enacted until 1956. Many a small town went under because the interstate was too far away or there was no exit to bring travelers into them. I wasn't kidding in my post. You were lucky to get asphalt and usually hit some jackass doing 30MpH in front of a long line of cars. If you could average 50 miles an hour you were doing good. That was my experience too, Expat. I got my driver's license in 1964, and interstates were not really of a feature of my state. Lots and lots of two-lane highways, though, and to really mess things up, a couple of stretches of three lanes, where the middle lane would alternate between directions every couple of miles, causing lots of headaches and bottlenecks. And of course, no such thing as bypassing any towns or cities, all roads went through the heart of most of them. We set up an aviation repair station in Burns Flat, OK back in 98. 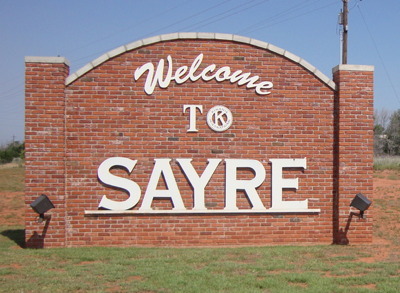 Sayre is right down the road from there (along Interstate 40) and along the old Route 66. They used to have signs around saying they're the friendly city. Not much else out in that neck of the woods. Not really much in the way of woods either, more like sage and scrub brush. There must be a third town along this route, where the residents feel they have a lot to show tourists, so they flash anyone that drives by. One of those citizens relocated to a strategic corner a few miles from where I live. He was able spread his cheerful message for quite a while until they finally netted him and hauled him away. 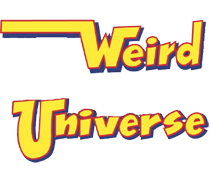 It seemed like everyone knew about "Oh yeah, that guy."